I am excited to announce that Green Door Real Estate is now EXIT Realty Bay Area. After lots of prayer, thought, and work I have decided to take our boutique brokerage to the next level by becoming a franchisee with EXIT Realty. 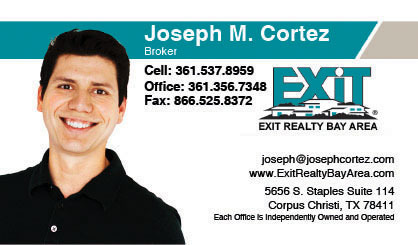 EXIT Realty International is the fifth largest real estate company in the United States and growing. With its unique single level residual program, unparalleled training, technology and a strong focus on personal growth, my family and I felt EXIT was a must. Below is the story of my decision and how God showed up in the process. For the past five years I have attended an event called Mastermind in San Diego. The event is hosted by Buffini and Company, the professional real estate coaching company I have hired to help me in my business. At each event there is a session dedicated to goal and vision writing. This past August I set a goal that in 2014 Green Door Real Estate will grow to 15 agents. On the plane home I began thinking about this goal and how to go about it. I had never recruited before or even tried to. I knew long term I wanted to grow a team where I can be a coach and help agents build successful businesses and family lives. I wrote down three things: Training (professional and life), resources and support, and a strong financial model. These are three elements that agents need to succeed in the tough and rewarding business of real estate. I started looking around at companies across the country to model. I wanted to pick the best of what was working. I then came across EXIT and knew it wasn’t just a model I wanted to emulate; it was a company that I wanted to be part of. They have strong training, support, and the best financial model in the industry to create strong brokers and agent. I had looked into EXIT almost ten years ago when they were in their infancy and thought it was a great idea then. The timing was just not right for me at that time. In September I inquired about EXIT through the company’s website. A little time went by and I received an e-mail video message from Tami Bonell. We then set up a time to speak on the phone. Little did I know at the time that she is the CEO of EXIT Realty United States. We had a great conversation and set a follow up. On the next call she asked if I could go to Washington DC to their national convention. My wife and I debated if we could make it work. The morning we were discussing the trip and EXIT I turned on the TV for my kids to find Joyce Meyer was on. I wish I could remember the exact words she spoke, but it was something to the effect of, “I you are given an opportunity, don’t let your fear keep you from exploring it. While you are exploring the move God will make it clear if it’s from him.” I booked my trip shortly after. At the convention I met several great people, including the founder of EXIT, Steve Morris. One thing stood out to me while at the convention. During the lunch Steve stood in line with the rest of the several thousand people there. He did not hide or seek special treatment. He was one of us. During his keynote speech he expressed the poise and leadership that one would expect from a world class CEO. He laid out his vision for the company and I felt a great energy in the room. The Sunday after the convention, my pastor, Pastor Bil Cornelius, made a point during his sermon that struck me. Part of the quandary I was feeling was giving up my dream of Green Door and the vision I had set for it. Then Pastor Bil said that sometimes God will accomplish your dreams when you attach them to a leaders vision. Essentially if you help someone accomplish their visions your vision will be met along the way. I quickly realized the vision I had for my company can still be, it just may have a different name on the door. I made the commitment to purchase a franchise and in December was in Canada for a week of training. The whole time God kept showing up and lining up people and the timing for this new step in the life of my family. I feel whole heartedly that this company will change the lives of hundreds of agents in our market place and my family tree forever. This is not going to be easy. There is going to be a lot of ups and downs, frustrations and joys. The journey is the exciting part. What we need from you is support in the form of referrals to customers and to agents. I am excited about what God is going to do through us to change the real estate community in Corpus Christi. I am excited about the growth I am going to experience. I am excited about documenting my journey as a fatherpreneur. The EXIT change is just part of my overall dream of helping me and women live fulfilled lives with successful business and successful families. I could keep writing for hours about what we have experienced of the past few months, owever, I must literally go and start switching out yard signs. Congrats to you! Prayers for a very successful future. Congratulations Joseph! Exciting times are ahead. Hershel & I are so excited for your opportunity! We admire the Cortez family’s entrepreneurial spirit and are here to support you in any way possible! And please count us as customers, as we are in search of our first family home! Praying for continued blessings for you & the family! I’m happy for you Joseph!